The Daily News of Open Water Swimming: Google Googles For The Open Water? Google Googles For The Open Water? Traditional Swedish goggles or Aquasphere’s wide-angle lens? Mirrored or clear? Prescription or optical? Open water swimmers have so many choices of their favored goggles – and the choices continue to expand as the sport grows. When a child puts on goggles for the first time, they just grab a pair, put them on their head, squint their eyes and put their head underwater. If no water leaks, they take off swimming. If water leaks, they look for another pair. In contrast, when an adult put on a pair of goggles for the first time, they often first ask for recommendations from their friends, read magazine reviews, browse online forums, and comparison shop based on price and looks. Then they do what a child does: test if the goggles work for them. Now adults may have another brand of goggles to consider, review and test. A pair of goggles that kids just put on and enjoy…or not. Google has developed a wearable monitor that enables land-based users to see its mini display as they go about their regular activities and see emails, photos, maps, texts, calendars, reports or any digital content normally viewed on a mobile device or computer. 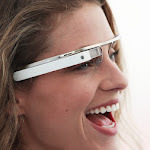 This year, Google’s special projects laboratory Google X announced Project Glass that outlines its plans to develop augmented reality goggles. Thad Starner is the technical leader of Project Glass. "We’re trying to make mobile systems that help the user pay more attention to the real world as opposed to retreating from it. It’s only been recently that these on-body devices have enough power, the networks are good enough, and the prices have gone down enough that it’s actually capturing people’s imagination. I think you’re going to see it happen real soon." And the open water swimming world may have the pleasure to experience a version of the Google Goggles in 2012 when Ben Lecomte starts off on his swim across the Pacific Ocean. According to hints and rumors, Lecomte will be using the world’s highest-tech goggles that will enable Lecomte to see content in his custom goggles while he is swimming across the largest body on Earth. Lecomte will speak of his experiences at the 2012 Global Open Water Swimming Conference held on the Queen Mary in Long Beach, California on September 22. In a unique technological hook-up between the moored Queen Mary and Lecomte out in the Pacific Ocean, the conference audience and fans around the world with an Internet connection will be able to "see" what Lecomte is experiencing out on the Pacific. Unique. Educational. Entertaining. Goggles for the 21st century.